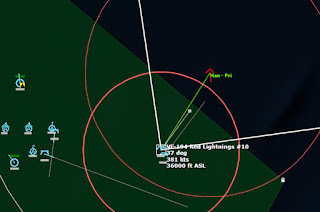 In Part One of this scenario I did a lot of math, calculating fuel expenditures and flight times, in the hopes of generating an Air Tasking Order where I could coordinate my strikes. I'm sure I made some mistakes, hopefully none of them critical, but fortunately this is a simulation and real lives are not at stake. All that's left is to set up all the missions and see how good my calculations were. Undoubtedly, I made some mistakes in my calculations, but we'll see just how badly the plan falls apart because of it. On top of that, no plan survives contact with the enemy, so we'll see how well my strikes actually play out. 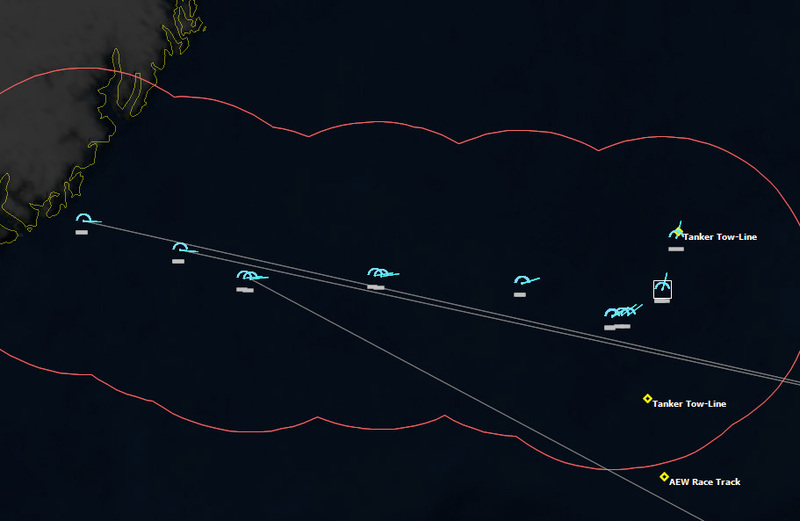 The sudden appearance of Soviet submarines or surface units could throw a wrench into my plans as well, so I'll have to be on the alert for them too. All the planning is completed, so now begins the mission. Taxi lights from dozens of aircraft strobed on the tarmac in the dark of the night as dozens of aircraft maneuvered along the taxiway to the eastern end of the airbase's lone runway. The F-4Cs of the 57th Fighter-Interceptor Squadron, "the Black Knights of Keflavik," were first in line. 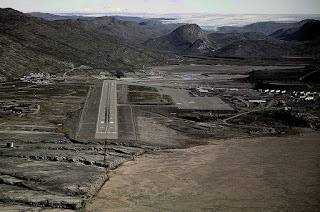 The 57th FIS had been stationed on Iceland when the war had broken out, and had been chased away by the Russians, and now they would take the first steps in taking it back. Behind them were the F-105G Thunderchiefs of the 561st Tactical Fighter squadron, Wild Weasels, tasked to take out the air defenses of the Soviet forces on Iceland. And behind them were the B-52Ds of the 20th Bombardment Squadron, the "Buccaneers." Their job was to destroy the runways at Reykjavik and Keflavik, stopping the Soviets from using them to resupply their forces. In back seat of the lead F-4, Colonel George "Hickory" Jackson was eager to get airborne, and watched the seconds tick down until mission start. As squadron commander, for this mission he served as both Weapon Systems Officer (WSO) and Mission Commander. "Ready, Buck?" he asked his pilot. "Affirm." replied Major Mike "Buck" Rogers. Jackson thumbed his mike switch. "Knight 12, Knight 11, say status." Knight 12, his wingman, wasjustt off his right wing. In the darkness he could barely see into the F-4C's cockpit, its crew dimly illuminated by the instrument panels. "Sondrestrom Tower, Knight 1, Flight of two, ready for takeoff, runway 28." "Knight 1, Sondrestrom Tower, position and hold." "Position and hold, Knight 1." Major Rogers nudged the throttle quadrant forward, and he and his wingman maneuvered their aircraft into position on the runway. Right as the clock hit 0202 Zulu time, the tower came back on, "Knight 1, cleared for takeoff, proceed without delay. Good hunting." 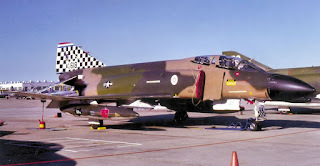 As one, Knight 11 and 12 advanced their throttles to full military power and the two F-4Cs rolled down the runway. Rogers eased back on the stick and they were airborne. He let the aircraft increase speed to three hundred knots and then eased it into a right turn, bringing it back to a course of 089. 0205Z 230 miles from Keflavik, an EC-121 H Warning Star Airborne Early Warning and Control aircraft flew a racetrack pattern, watching for activity over Iceland. 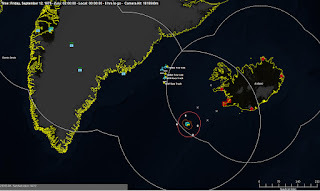 It had picked up emissions from multiple SA-6 Gainful SAM batteries around Keflavik and Reykjavik, marking their locations for transmission to the SEAD aircraft that would be raiding in a few hours. 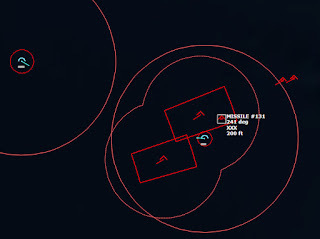 It also picked up several aircraft over Keflavik, and soon classified them as MiG-23M Flogger Bs. 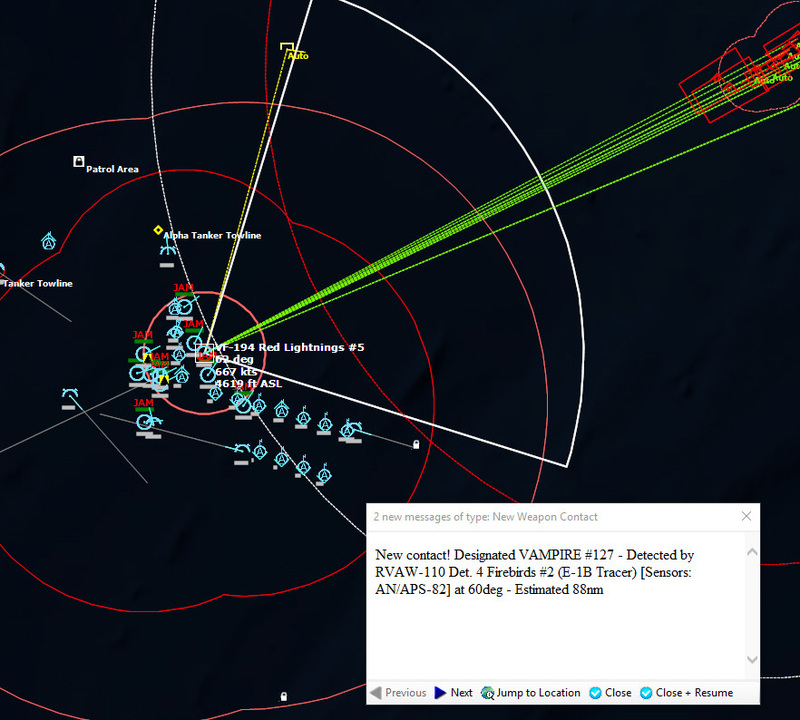 Likewise, over the Oriskany Group, an E-1B Tracer from RVAW-110 was clawing its way skyward, radars active. 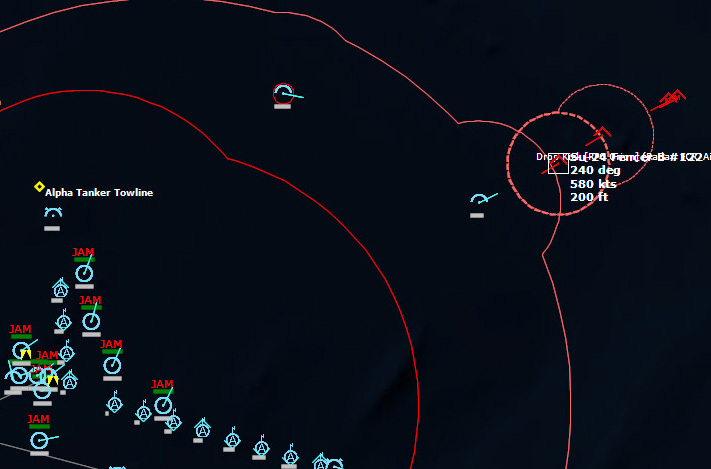 Detecting the apparent inbound raid, it radioed warning to the Oriskany group. 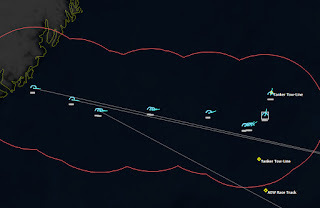 The ships were already radar active. 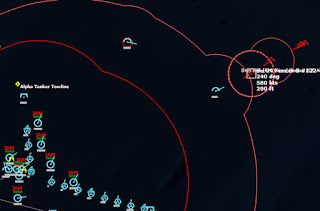 The pilot began to turn to the south, as the last thing he wanted to do was interpose himself between the missile ships below and the inbound fighters. Aboard the USS Dale, Captain Jones listened to the CIC talker announce the threats. "Raid One is four aircraft, classified as Flogger-Bravos, 060 for 80 miles, 920kts closure. Weapons Free." 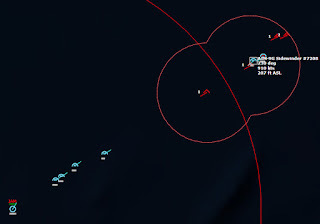 A second group of MiG-23Ms appeared to be heading west, although not directly at the EC-121H Warning Star, and was likely a CAP defending Keflavik. "Raid One 060 for 40 miles. Weapons free. Birds away!" On the USS Dale, the aft Mk10 Twin Rail missile launcher unleashed a pair of RIM-67A SM-1ER guided missiles, which locked onto to northern pair of MiGs. Immediately the rails reset and the mount swiveled back to the magazine to reload. Seconds later the forward launcher sent off its pair of missiles. 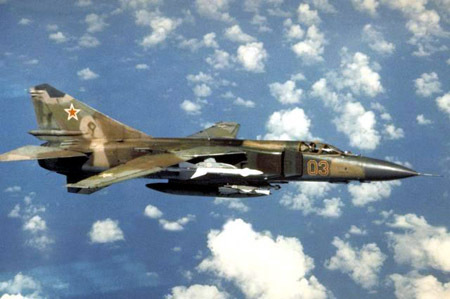 The MiG-23M pilots detected the inbound missiles, and began to maneuver to avoid them. The first pair of SM-1ERs closed in. One MiG-23M dodged the SAM, while the other was blown out of the sky. The second pair of SAMs missed its targets, and Dale launched a second salvo. 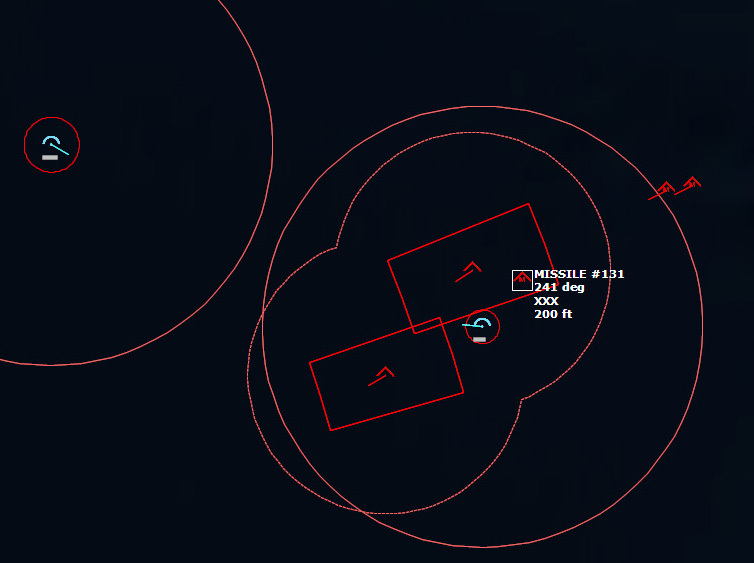 The second salvo killed two more of the MiGs, leaving a single one left. The two F-8J Crusaders flying CAP over the group seized the opportunity to close into Sidewinder range. The CAP moves in to finish off the last MiG. The fighters rocketed past each other at over 1000kts, and then engaged in a turning fight. 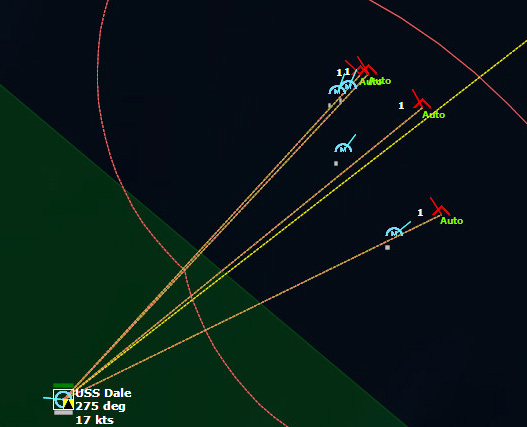 Dale, however, was not yet done, and fired one more SAM, which threaded its way through the dogfight to nail the MiG. 022130Z "Contacts, MiG-23M Flogger Bravos, four-ship, designate Raid Two. 060 for 100 miles, 920kts closure." Captain Jones scratched his chin. What were they doing, sending only four MiGs at a time? 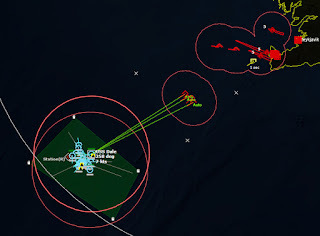 One group of four Floggers patrolled back and forth in front of Keflavik, while the new group closed in on the Oriskany group at high speed. The Dale's launchers would again be busy. 022550Z "Birds away!" 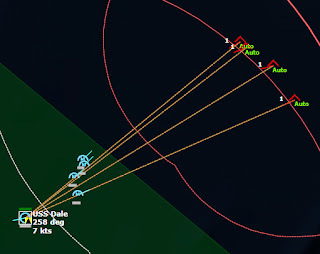 Dale's launchers went active again, launching at the inbound Floggers. USS Dale launches s SAM at the second inbound raid. 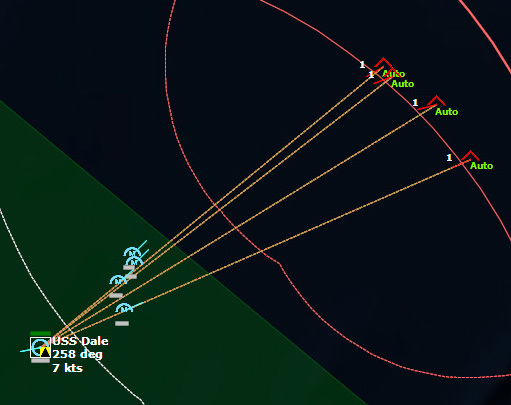 USS Dale went three for four on the first salvo, and then killed the last MiG with a followup SAM. The Leahy-class cruiser was performing well, shooting down eight Floggers for the cost of thirteen SAMs. 023043Z "Vampire! Vampire!" called the Radar/Intercept Controller aboard the E-1B Tracer above the Oriskany group, "Bearing 062, estimated 162 miles." 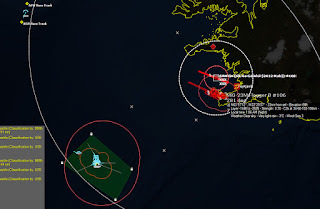 "That's over Keflavik," noted the other controller. "What are they shooting at?" Inwardly he thought hard, could they be surface launched cruise missiles? Ballistic missiles? "Vampires are climbing through angels 15, 675kts. 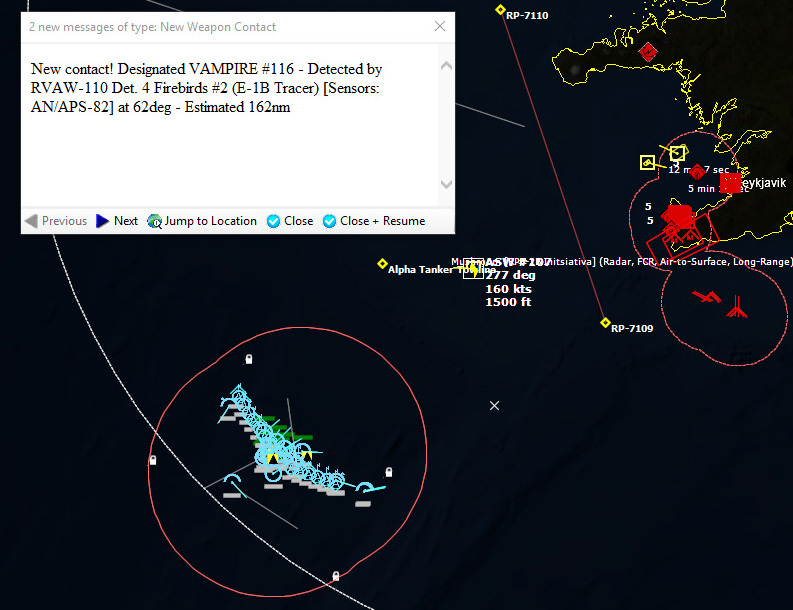 Vampires are inbound, bearing 062 for 158 miles." "Vampires are leveling off at angels 20." Captain Jones nodded, watching the plot. "Classify them." A moment later, a tech called out, "Possible classification on Vampires, SS-N-3 Shaddock or SSC-1 Sepal." They were land-based, Jones thought, so that made them Sepals. He tightened his lips. They could be standard anti-ship missiles, or they could contain 350kT nuclear warheads. Considering how free the Soviets had been with their nukes so far in this war, there was a very real possible that these were nukes as well. Jones watched the plot as the vampires closed in, approaching the Dale's SAM envelope at just over Mach 1. 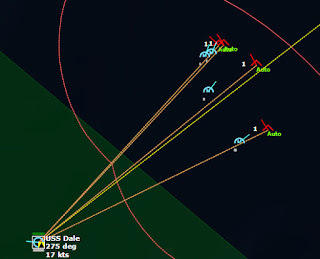 At a range of 35 miles, Dale launched a pair of SAMs at each inbound missile. 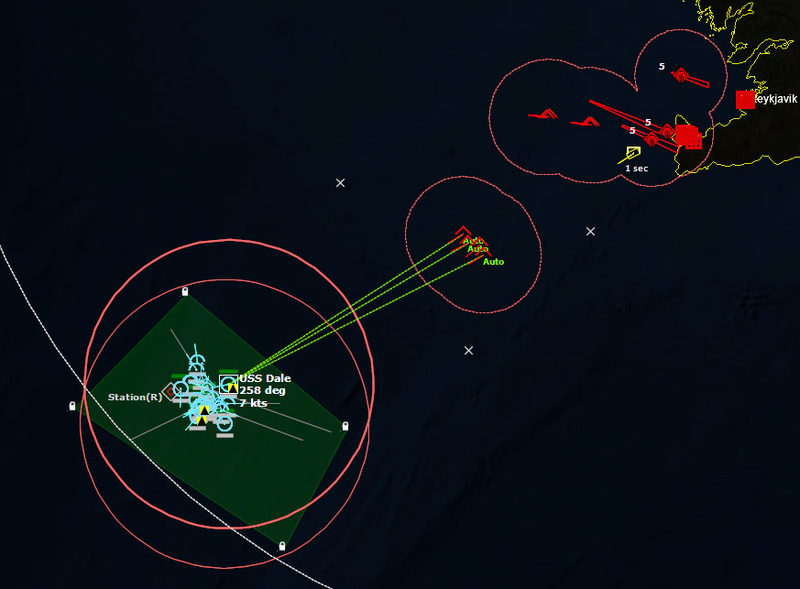 Dale launches a pair of SAMs at each inbound missile. Unlike the Floggers, the missiles did not turn away in an attempt to evade the SAMs, and the SM-1ERs shot both down easily. 024105Z "Vampire! Vampire! Bearing 054, estimated 155 miles. Looks like another pair of cruise missiles." "They'll be launching these all day." "Let's hope they run out of them before we run out of SAMs." 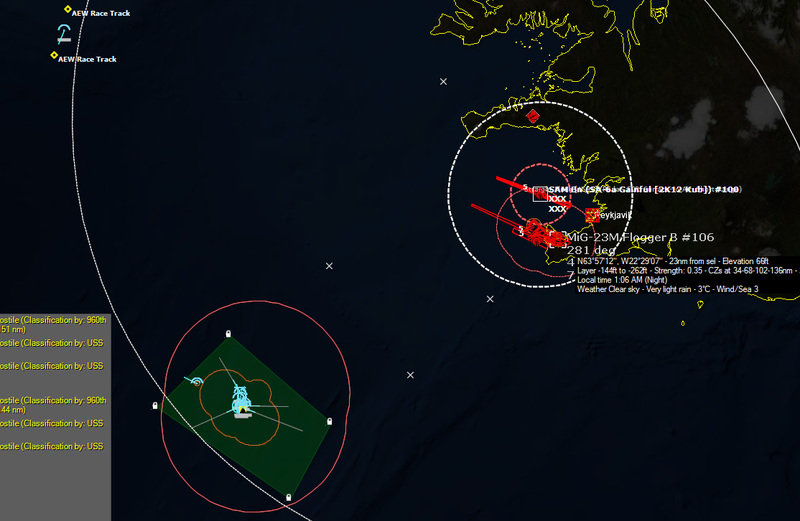 024807Z "Contact, multiple bogeys detected over Keflavik, classified as Su-24 Fencer Bs, count five." 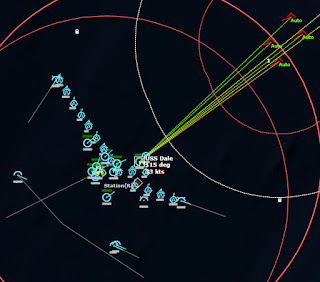 The CIC talker relayed the report from the Warning Star over the Denmark Strait, but Captain Jones had other things to worry about, as Dale had just launched SAMs at the incoming cruise missiles. One by one the SAMs rose up and took out the two missiles. 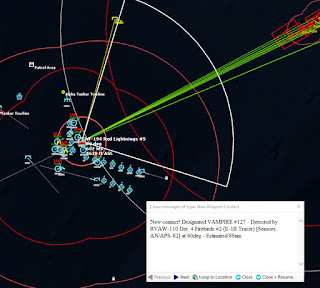 "Vampire, Vampire, " Another salvo of cruise missiles was inbound. "Fencer Bravo raid count is five, inbound at 567kts, 060 for 105 miles,"
"Send the CAP to intercept." "The CAP is just beginning refueling operations, sir." "Launch the alert fighters, then." Two minutes later, Lightning 204 and 205, a pair of F-8J Crusaders from VF-194, the Red Lightnings, launched from Oriskany's catapults and headed northeast on afterburner. "Vampire! Vampire! The Fencers have launched missiles! Count six, bearing 061 for 86 miles. Altitude three-zero feet, speed 1150 kts." Just as the Oriskany launches interceptors, the inbound Fencers launch missiles. 025635Z Lightning 205, one of the F-8J Crusaders, dropped down to 300 feet ASL to go after the inbound vampires, and just as he he was closing in, he saw them disappear off his radar in rapid succession. "Alpha Bravo, Lightning 205, Vampires have splashed." Having been fired at max range, the cruise missiles had run out of fuel and crashed into the sea. The Crusader pulled hard to port and maneuvered to engage the Fencers. "Lightning 205, engaging Fencer, Tally ho! Guns! Guns! Guns! Splash One!" The Crusader broke hard starboard to go after a second Fencer, and then saw an inbound missile, no doubt fired by the third Fencer. "I'm hit! I'm hit!" The AA-8 Aphid impacted the F-8J, sending it corkscrewing into the sea with no time for the pilot to eject. 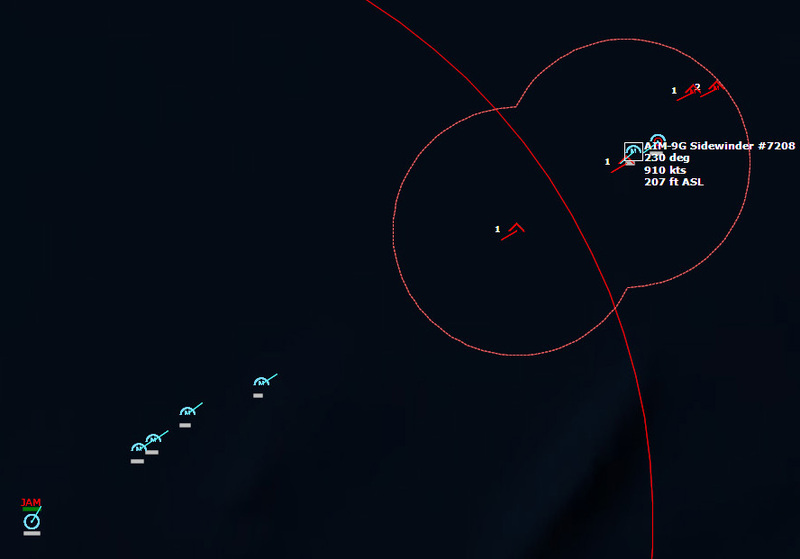 Lightning 204 closed in on afterburner from the northwest, descending rapidly. 30 miles to the southwest, USS Dale began firing SAMs. "Fox Two!" Lightning 204 called out, as it achieved missile firing position behind the rear Fencer. 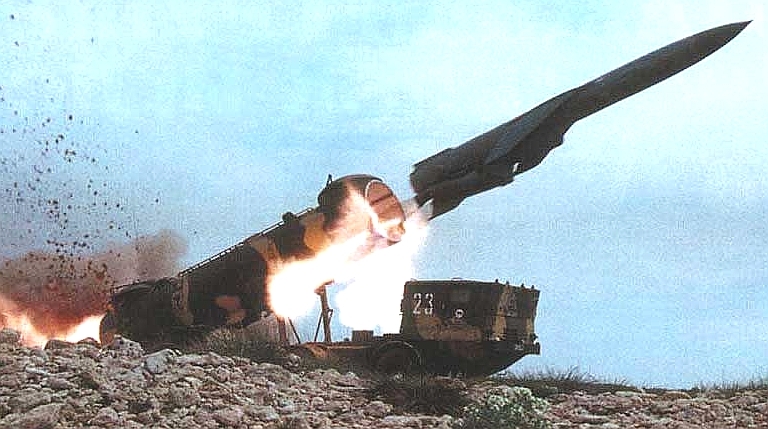 An AIM-9G Sidewinder shot off the rail, tracking the Fencer. "Fox Two, Fox Two again!" 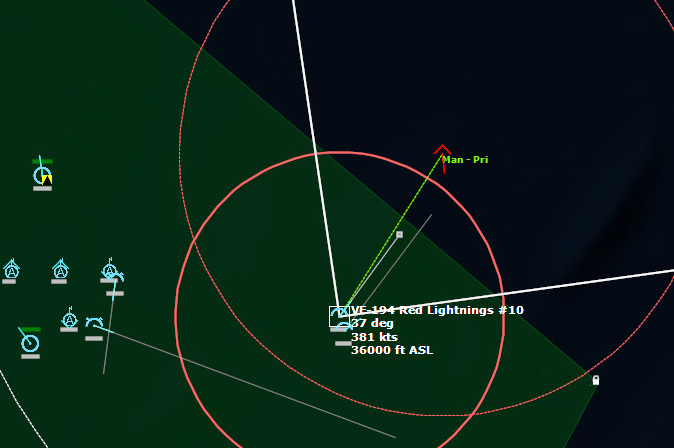 Lightning 204 called as the first Sidewinder missed and he launched again. This one tracked its target and destroyed the Fencer. Dale's SAMs took out the last Fencer and the two inbound cruise missiles. 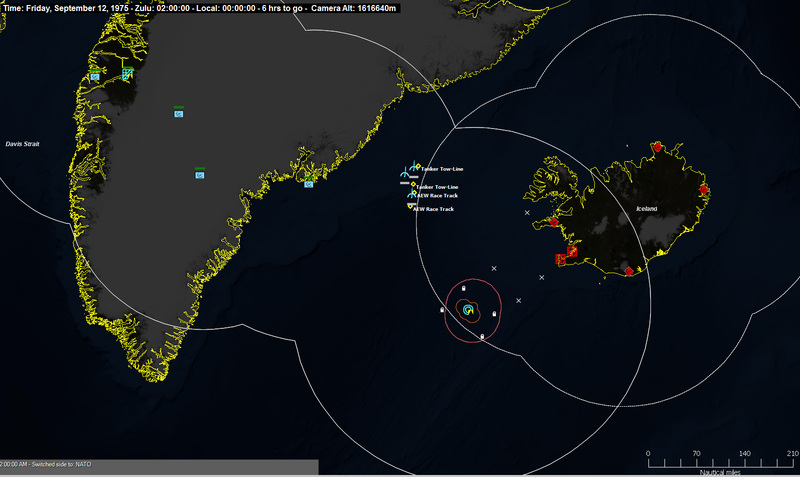 Soon after, a further two cruise missiles are detected launching from Keflavik. This salvo would take more SAMs, but again, USS Dale would take them out. And again, another salvo was launched. 0305Z The F-4Cs of the 57th FIS began to arrive at the tankers, and began topping off their fuel tanks. Once refueling operations were complete, they would take the fight to the enemy, and destroy every Soviet aircraft they could find. 0310Z Colonel Jackson's fighter detached from the KC-135, his refueling complete. The Colonel sent the coded burst transmission to the Warning Star, which went active with its radar. The hunt was about to begin.